Thanks to a few bad apples, ACORN is no longer just an oak-tree nut. McCain blames the group for "maybe perpetrating one of the greatest frauds in voter history." Members of Congress have demanded investigations. The fbi is asking questions. Republican protesters have started crashing political events in squirrel costumes. Yet the problem of registration fraud is age-old. For decades, both parties and many other groups have paid people to go out and register new voters. In the case of acorn, a community group that represents low-income and minority communities, this led to a massive registration drive this year, which signed up 1.3 million new people, mostly in swing states. The problem is that a small fraction of those new voters don't exist. That's because the 13,000 part-time workers conducting the acorn registration drive were paid on a quota system, providing them a clear incentive to fabricate registrations. Across the country, registrars have flagged thousands of acorn forms as suspect. In Florida, "Mickey Mouse" tried to register with an application stamped with the acorn logo. 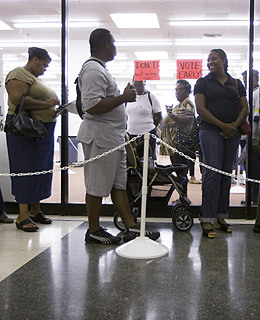 The starting lineup of the Dallas Cowboys signed up to vote in Nevada. But there's a difference between registration fraud and voter fraud; the latter has not been documented on any significant scale in decades. Phony registrations are difficult to translate into fraudulent votes. Under federal law, new registrants still have to provide election officials with identification before casting their first ballot. Unless Mickey Mouse has an ID, the chance that he'll vote is slim. Democrats complain that trumped-up charges of voting fraud could scare people from the polls. On the other hand, the acorn effect makes elections suspect  and that's bad for everyone. Republicans in several key swing states have argued that the false registrations make it necessary to monitor polls and challenge suspect voters. If that happens on a grand scale, the voting process could become more like running a gauntlet than exercising a right, with polling-place delays and confrontations that could scare people off or just lead them to conclude it's not worth the time.